As you may know, Osamu Tezuka wanted his story of Kimba to follow Kimba's entire life. The Kimba (Jungle Emperor) series was such a hit in Japan that Dr. Tezuka produced a sequel the following year, known in Japan as "The New Jungle Emperor" or "Onward, Leo!" The trouble (for us in the rest of the world) was that he made the series without making a deal with NBC Enterprises, who had produced the English version of Kimba. 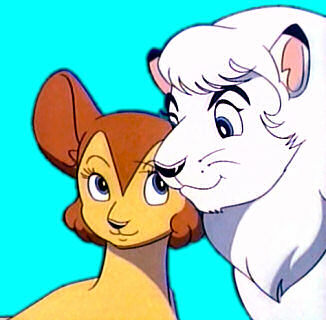 The folks at NBCE were quite happy with the 52 episodes of Kimba they already had, and didn't think people would want a series about an adult lion, so the "Onward, Leo" series wasn't seen in English until 1984, when it was dubbed by a different company and given the title "Leo The Lion". We're told, by anime historians and by the Tezuka Company web site, that this series represents Osamu Tezuka presenting his original "Jungle Emperor" story the way he wanted to do it, without all that 'meddling' by the Americans (that resulted in the production of Kimba, one of the greatest animated series of all time). But, this isn't really true—aside from a few episodes, most of this series is different from the manga story. And in the last two episodes, the outcomes of situations are changed. "Ah," the same people tell us, "Tezuka felt compelled to change these two stories to satisfy the wishes of the audience." So, what do we have here, then? A purer presentation of the white lion's story, or pandering to the audience? Actually, I think the answer is "neither". Those altered outcomes in the last two episodes are much better storytelling than what was in the manga. It would appear that Tezuka had new ideas about his story, and presented them in the "Leo the Lion" series. He was, after all, fully involved with the entire production. In "Leo the Lion", a couple of years have passed since the end of the first series. Kimba and Kitty are now adults, and early in this series they have cubs of their own. One of the key points that was lost in the translation of the Kimba series is that in the last Kimba episode (“Silvertail, the Renegade”, which was originally titled “The Man-Eating Lion” in Japan), Kimba promised to keep his animals separate from humans, and that promise underlies Leo's actions in this series. So there is somewhat of a different feeling to these stories. Most fans have not seen the episodes in their intended order, and without that key piece of information, there has been some confusion about the series. If you should have the good fortune to see the entire series, in the order in which the episodes were meant to be seen, an overall story arc becomes clear: While Leo is busy with his responsibilities to the other animals, his cub, Rune, emerges as the real star of the series. Rune grows and matures over the course of the series, becoming a confident hero. "Leo the Lion" has been been difficult to see in its entirety. In the US, it was only shown on a small cable network in 1984, before most people even had cable. Then severely shortened episodes were haphazardly released onto video. Seen in piecemeal fashion, it's really difficult to watch Rune's progress. If more people could see the entire series, in order, I think the true value of these stories will become evident. This is actually a strong series, and deserves to be better known. These DVDs are the only way to see the entire series. Find all of Leo The Lion in English on DVD. My own review of some Leo the Lion episodes. Information about previous Leo The Lion releases on home video. Something on this page was changed on September 14, 2010.